Today, the Reserve Bank released the results of the 43rd round of the Order Books, Inventories and Capacity Utilisation Survey (OBICUS) for the quarter July-September 2018 covering 945 manufacturing companies. The survey provides a snapshot of demand conditions in India’s manufacturing sector1. 1) Capacity Utilisation (CU): At the aggregate level, CU rose to 74.8 per cent in Q2:2018-19, co-moving with the de-trended index of industrial production2 (IIP) (Chart 1). Seasonally adjusted CU also increased by 0.4 percentage point to 75.3 per cent in Q2:2018-19. 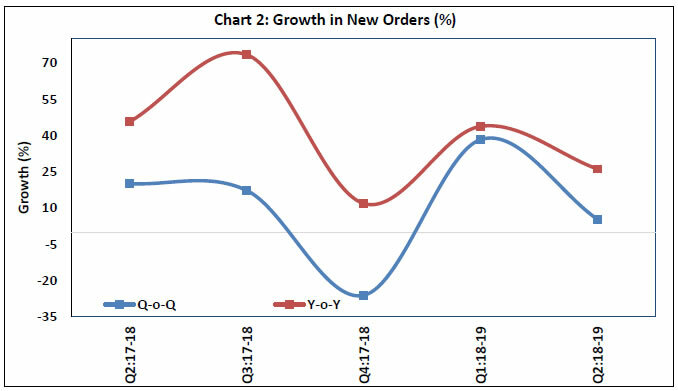 2) Order Books: New orders growth moderated in Q2:2018-19 (Chart 2). 3) Finished Goods Inventory (FGI) to Sales Ratio: In anticipation of higher demand in the festival season, producers might have stocked up on finished goods leading to increase in the level of FGI to sales ratio from the previous quarter, (Chart 3). 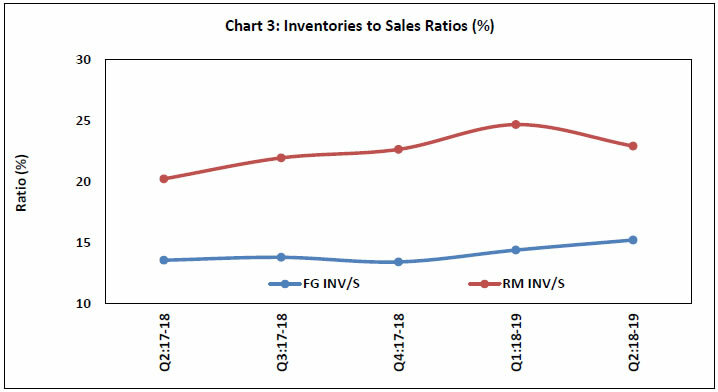 4) Raw Material Inventory (RMI) to Sales Ratio: The rise in sales during Q2:2018-19 brought the RMI to Sales ratio closer to trend level (Chart 3). RM - Raw Material; WiP - Work in progress; FG - Finished Goods; Inv – Inventory. 1 The survey responses are voluntary and difference in sample composition may affect the results to some extent. The 42nd round of the OBICUS covering 994 manufacturing companies with reference period as April-June 2018 was released on the RBI website on October 05, 2018.